Are you ever entertained by what pops up when you start a Google search? 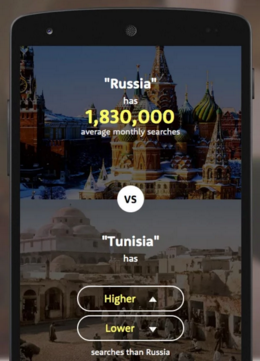 The Higher Lower Game has turned Google searches into an addicting game, and you won’t be able to stop. Every time you enter a search in the Google bar, not only what your searching appears, but random and sometimes ridiculous answers appear too. They’re a good laugh, but do ever wonder what’s googled the most? If you think you know the answer to that question, test your knowledge in The Higher Lower Game. 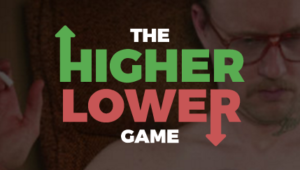 The Higher Lower Game is super addicting and frustrating at the same time. The whole point is to guess what gets searched more on Google. You’ll be give two options, and you just have to guess which one is searched more. Once you guess, you’ll be given told how many times a subject is actually searched in the past month. You can play right from the website, or download the app and take the game wherever you go! You’re never going to want to put The Higher Lower Game down, and it will continuously keep you guessing.